This is a super easy way to make affordable amazing dreads!! AND how to put them in! 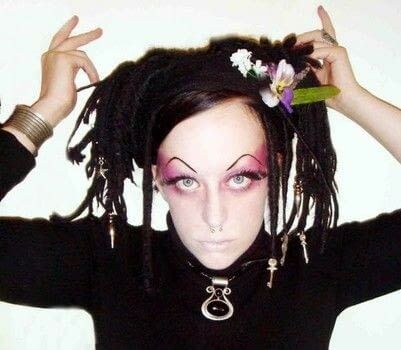 I always wanted dreads but it was just WAY too much money. SO, I decided to make my own using 100% wool yarn!!! Sorry there is not pictures to go with the instructions! Using your 100% wool yarn, choosing the color you decide, cut a bunch of stands of yarn. The way you want to measure them is as follows. Take the length of your hair and double it, now add about 6 inches to make up for the braiding and shrinking. Take 9 strips of the yarn seperated into three sets of three. Tie one end to the back of a secure chair so that you can braid the entire length of the strand. At the end of each strand tie it off so that it does not unwind. 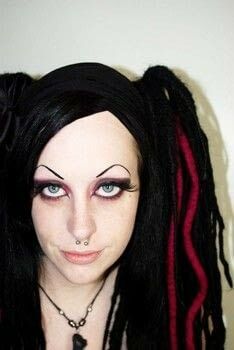 You need to make enough braids to cover your entire head. I would say about 30 total. Place the braids into a pillow case so that they do not get tangled in your washing machine. Wash them with a small amount of soap and on hot. When finished allow them to air dry for about an hour. It wont take long. NOW for the FUN part!!! 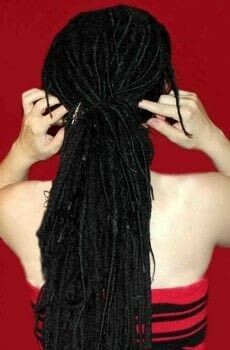 Installing your new dreads!!! Take a small mini rubberband then place it in the center of the braid so that it is folded in half creating two strands. Take a comb and part it into small sections. You can decide on starting from the top of your head or underneath, I have done it both ways and think top is best. Secure the rest of your hair so it does not get in the way. Take the rubberbanded braid and attach it to the base of the head with the band. Okay, now you are going to take the small section of hair that you just secured the braid to and split into two sections. Taking the two sections of your hair and ONE strand of the braid and braid them together all the way to the bottow. Secure with another small rubber band. Move on to another section of hair and repeat step numbers 6-7. Do your entire head of hair. You can do a few strands of JUST your hair braided too to make a different textured look. Once your whole head is done then you are finished!!! There are multiple ways to take care of your dreads. YOu can wash them in the shower but they take a long time to dry or you can use dry shampoo. You can usually keep them in for about a month before unbraiding them to be washed. Also you can add beads, charms and you can make other color dreads to tie into your hair later!! Amazing! I'm not gonna lie I was dubious at first but they came out of the washer looking spectacular thank you so much!! Your method is so awesome.I used to make falls all the time before I decided I needed to have perminate ones. I hope I remeber this when I go back to hair that I must brush! quick question though, will these look as good if I don't install them to my hair, but do like falls? 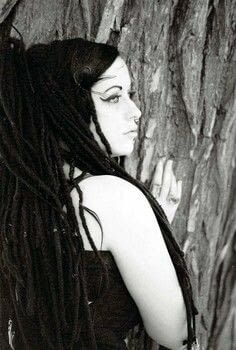 Is there a way to only do a couple dreads, instead of your whole head? I am not allowed to get my whole head with dreads, any suggestions for putting a couple dreads in, like placement and care or the dreads? when you say wash with soap, do you mean the normal stuff you use to wash clothes with? Looks great and easy! But I've got just one question. Do you need to make shorter dreads for the lower parts of your hair, like the neckline?